Uh oh, I'm hooked on a new series!! So many books, so little time! At any rate, this is a good crime drama with a great lead detective character. The story progresses smoothly with strong supporting characters. While you may guess who the murderer is (I was pretty sure but not certain), you find that the reasons aren't entirely obvious, but make sense when revealed. 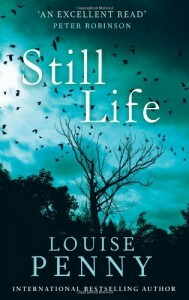 I also really liked the story behind the title, Still Life. I had actually highlighted that part of the book, before it gets referenced at the end. There are now 11 books in the series. I'll definitely be reading the second one and, I suspect, 3 through 11 and any more that may follow!